There are currently 32,632 users on this website. It's a relatively common coin. We can't see through the plastic to get a good idea of the coin's condition, but it's probably in the $20 range. Don't take it out of the holder, though; the provenance (where it was found) written ont he back might add some interest and value. I will also move this to the Ancients subforum for more comment. It's best to remove the coin from the 2x2 before you take a picture so we can see what the coin looks like. From what I can make out I would say between $10- $15. I'd say DON'T remove from the holder; your coin is provenanced to a 19th century dig, which is more valuable than the coin by itself. 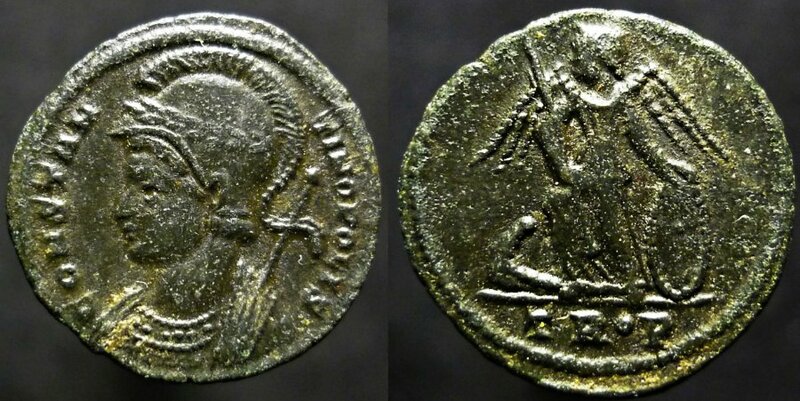 These are very common coins; yours probably isn't worth more than a few dollars on ebay, but the provenance would be worth a lot more to people who like ancients with a recorded recent history. I only meant to take it out of the 2x2 to take pictures it could be put back in after. Depends on how the 2x2 is put together, but I wouldn't risk it myself. What would you do if the old staples don't survive the unbending and re-bending? What's the big deal about this 2x2? I'm sure it's not from 1893 and if it adds any value to an otherwise common coin it's not going to be much. Anyone could have written that information at any time, there is not verifiable provenance to that information. with echizento. The 2x2 and writing on it prove nothing as far as provenance. It also hinders a good digital look at the coin. If this coin is worth more because of the poorly stored 2x2 it's in, then I need to rethink quite a bit. 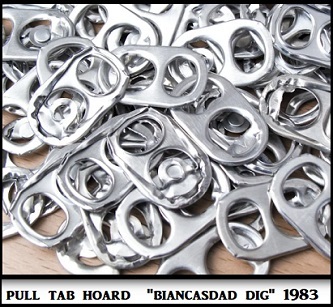 Reminds me of my metal detecting finds from college. And yet I see dumb dumb taking modern proof gold coins out of cases and leaving prints everywhere, just to take a photo and to weight the coin. O,o if you can afford a gold coin why don't you have a proper camera to do a high res photos. Weather that is the case for this coin I don't know. Personally I guess the extra info is better. They are fairly common ancient coins but very historical and important - struck to commemorate the founding of Constantinople. Here is my example.. worth around $20. better photographs. Ancient coins are meant to be handled anyway... I would keep the 2X2 with the coin as a reference. Obv. CONSTAN-TINOPOLIS laureate, helmeted, wearing imperial mantle, holding scepter. Rev. Victory stg. on prow, holding long scepter in r. hand, and resting l. hand on shield. Well as you're in the US and provenance is always important, best to keep the coin holder. Not even worth taking it out as all the information is on the holder already. 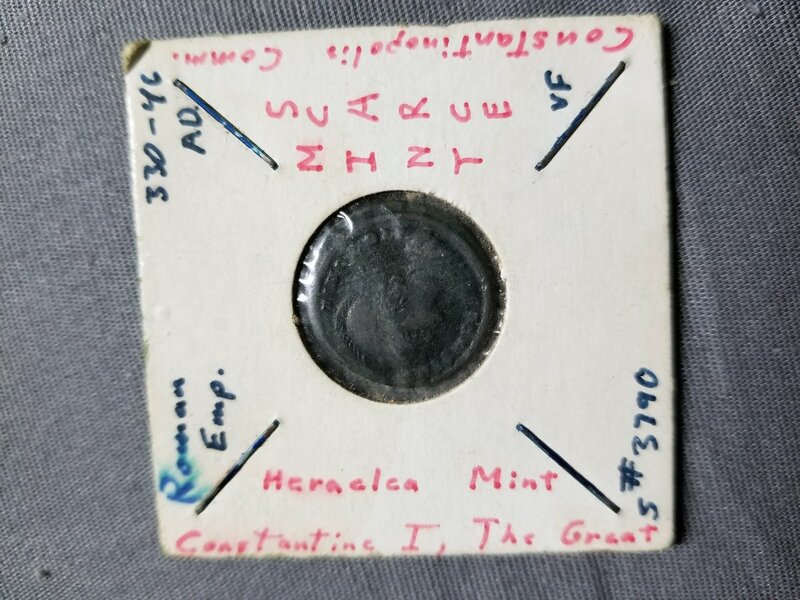 Mint of Heraclea. 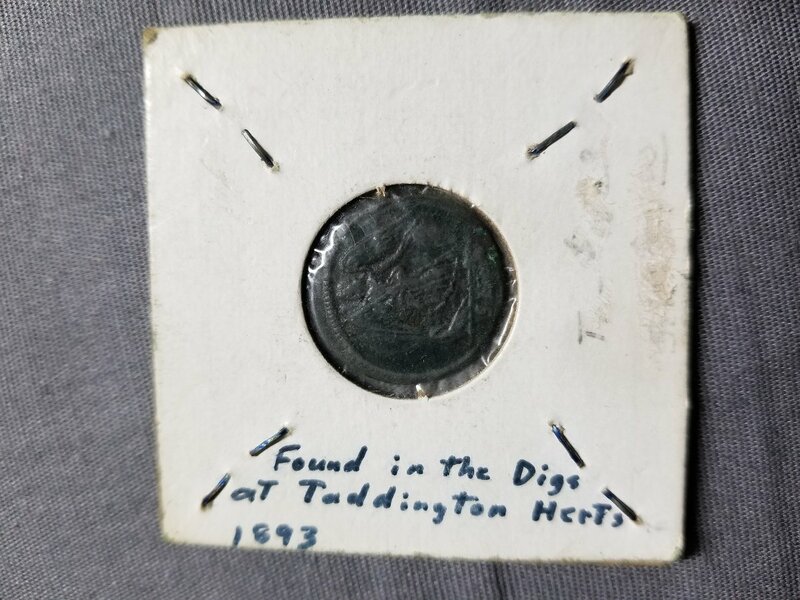 Quite unusual to have a coin from an eastern mint turning up in an archaeological excavation in the county of Hertfordshire, England. Most of the late Roman bronze coins that do turn up in such digs are from western mints like London, Trier, Lyons and Arles. Doing a search, there doesn't seem to be a "Taddington" in the county of Hertfordshire (shortened to Herts). There are towns of that name in the counties of Derbyshire and Gloucestershire. I guess whoever wrote that on the holder got the find information confused.